The year is 2015 and Disney owns everything. ESPN, Marvel, Star Wars, Pixar - they’re all under the all mighty gaze of the mouse house. This is good news for Disney Infinity, a series that has been building one of the most outrageous rosters in gaming history. The original Infinity title, which launched in 2013, was focused mainly on Disney classics and popular Pixar franchises, while the second installment expanded to the Marvel universe. This year we are unsurprisingly getting a heavy dose of Star Wars, a series who is getting its first major movie in the ten years the December. No wonder Disney wants to attract fans, old and new, into the web of a galaxy far far away. But even with it’s obvious promotional tie-ins, Disney Infinity 3.0 is a major step forward for the the series. Something I didn’t feel about the second iteration. I always come away with the same major consensus after playing in each new Disney Infinity. The game is fun. And it’s fun on a level that many other games can’t get to, because of it’s huge expanses of well-known and well-loved properties. While you can’t take any character into any play set (a specific franchise world), you can build and adventure with any and all figures in the game’s Toy Box mode. Spider-Man and Darth Vader can face off. Mulan and the Hulk can race around the mind of a 12 year-old girl in landspeeders. It really is a thing of beauty and it’s easily the part of Disney Infinity that makes me smile the biggest. It only gets better with each title, and 3.0 is no different. These are the Star Wars adventures you’re looking for. And I can say that without waving my hand like a Jedi. Terrible jokes aside, the Star Wars galaxy (at least the part we’ve seen so far) is a wonderful romp through some popular and obscure Star Wars lore. Even as someone who isn’t very deep into the Star Wars fandom (especially when it comes to the prequels), I found myself engrossed in the simple story and action the Twilight of the Republic play set had to offer. The intro to the Star Wars universe is the best one I’ve seen for any Infinity franchise to date. It actually puts you in control of various characters in different situations as it teaches you the basics of combat. AND THE BASICS OF SPACE FLIGHT! Did I shout that last part? I’m a big fan of on-the-rails space shooters, so being able to pilot the Millennium Falcon through an asteroid field or an X-Wing around the Death Star is my ideal Star Wars experience. Even in a game based on action figures, Star Wars seems to be more mature outing than any other franchise in the Infinity series thus far. I have a feeling more fans are going to jump on the upcoming Rise Against the Empire play set due to it’s cast (Luke, Leia, Darth and friends), but there’s still plenty to do, see and stab with a lightsaber until that time comes. The force is strong with this one, folks. I was a bit apathetic about the Inside Out play set, as I wasn’t sure exactly how they were going to turn the heart warming Pixar feature into an action oriented video game. But darn if they didn’t find a way. Not only that, they managed to make it into my favorite type of game - a platformer. While the story doesn’t make a whole lot of sense (and honestly it doesn’t have to) the gameplay, with the different emotions at its core, is really solid. Things switch from 2D to 3D platforming in every level, which is a nice change of pace from Infinity’s usual open world environment. Even in two player mode the play set works differently, keeping one moving camera on both parties at all times. Of course this means that if one player gets too far from their ally they will go into the classic New Super Mario Bros. bubble. It all seems a bit familiar, but it works just fine. This was definitely the play set my wife requested to play with me the most, and she’s no slouch in the platforming department. The combat in the first two Disney Infinity titles can be summed up in one word - mash. It wasn’t too thrilling to come upon a new enemy because you really couldn’t do much in the way of combos. In fact you really couldn’t do anything except switch up your initial attack. Baddie falls down, you wait for him to get back up, you hit him again. Rinse and repeat. Something especially monotonous when facing hordes and hordes of enemies. This time around the combat has received a much needed upgrade. This aspect is more prominent with Star Wars characters, who can string together attacks, force mechanics and newly added aerials. Players can put together combinations of different actions when attacking the average droid goon, and can even perform special maneuvers on special bosses and more powerful adversaries. It’s no surprise that the newest Toy Box is even more packed with tricks, items and non-playable characters than all the previous titles in the Infinity series. That being said, it’s also easily the most complicated assortment of world editing tools to date. Not that one has to take advantage of every aspect of the Toy Box’s wide array of options. In fact it’s the range that makes it so great. If you’re happy just dropping Disney landmarks all over the place or you want to make an elaborate maze of sensor-equiped booy traps, the Toy Box will work for you. I’ve said it before and I’ll say it again, Disney Infinity figures are the highest quality toys in the gaming scene. They may not having any moving parts, but they are super solid and they look fantastic. I had no initial plans to pick up figures for certain characters, like Sadness or Disgust from Inside Out. One look at their plastic perfection was all I needed to know they belonged in my ever growing collection. The amount of work that goes into finding the perfect pose, and then actually pulling it off is nothing short of astounding. As a collector I’m always blown away by these tiny sculptures and their attention to detail. For more on Infinity figures check out my interview with creative director Jeff Bunker. Disney Infinity 3.0 is at its best when it’s being shared with a friend or family member. I played the vast majority of the story campaigns and Toy Box tinker time with my wife. She might actually enjoy Disney Infinity more than I do. The team-up mentality always makes adventures and in-game experiments more enjoyable, not to mention more effective. The developers have also done a better job at making combat less infuriating with a partner in crime by helping players lock onto enemies and not each other. Luckily, the Disney Infinity 3.0 starter set comes with two figures (Anakin Skywalker and Ahsoka Tano) and they can both be used in the Twilight of the Republic play set. So you’ll be set some tag team Jedi-ing right from the get go. One of my favorite aspects of Disney Infinity 2.0 was the introduction of a skill tree for every character. It worked very well with the whole superhero aesthetic that was being promoted. Players could upgrade their characters with points they earned from leveling up and unlock new moves, abilities and upgrades. While the skill tree is still present and still gives players the ability to improve their characters, it has been split into multiple sections so it’s not quite so overwhelming. You can’t upgrade your characters in every category, so it’s important to read up on the benefits. While less action-oriented figures like Mickey and other Disney classics don’t have the most exciting upgrades, the Star Wars characters have some seriously badass upgrades. There’s just something magical about “force jumping” to the top of a building. I’ve never been too impressed with the graphics in Disney Infinity, especially when it comes to the Wii U (which is always the system I’m playing on). In fact, the game looks strangely better during normal gameplay as opposed to its many cut scenes. You might think Disney would go out of their way to enhance the textures and rough edges during story related close ups, but... I guess that wasn’t a high priority. There are some seriously cringe worthy models and character movements throughout the game, and you’ll always be happy to return to the action. I mean, I guess we are trrralking about a game that’s based on stylized toys with lots of sharp angles. That excuses seems like a cop out though. Infinity 3.0 is passable in the look department, it’s just nothing to write home about and at times is downright pitiful for a title produced in 2015 (Wii U or not). Disney Infinity has always been a series that embraces the past. And I don’t just say that because they keep cashing in on your nostalgia for classic Disney films. Every figure from the past two years will work within the game’s Toy Box, which has plenty to experience and explore. Unfortunately the actual play sets from previous installments can’t be used, so you’ll need to swap out discs if you want to wander around Monsters University or Marvel’s New York City. 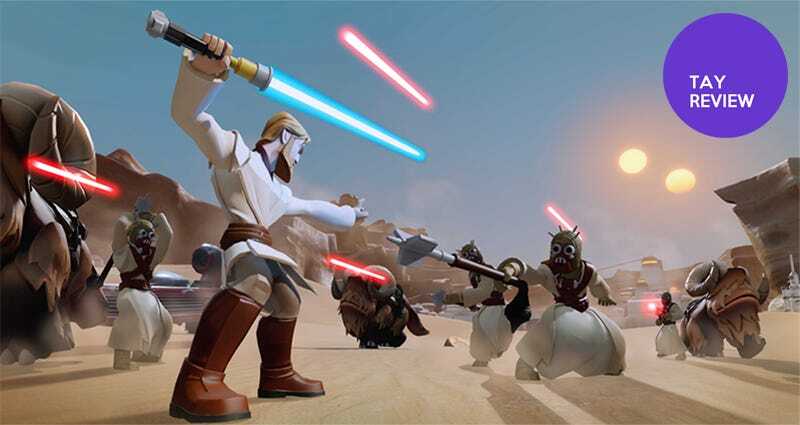 As usual, this year’s Disney Infinity comes with a whole slew of new things to purchase. Those who want to buy the whole first wave of figures will be out a few hundred dollars, that is if they’re not thrifty enough to wait for deals. There are usually a dozen “Buy One Get One” or “Buy Two For” deals between the initial launch the end of the year. It’s definitely not the cheapest series to be invested in, but with the right buying strategy players can snag most of their favorites on the cheap. You may think it’s not so bad, but we’re talking about around two minutes of straight loading before heading into play sets or new areas. It’s maddening! It’s hard not to compare the newest Disney Infinity to those that came before it. The series has grown in some substantial ways since it’s initial inception and it’s nice to see the team at Disney Interactive working so hard to improve the formula. There has never been a better time to jump on the Disney Infinity train, and that goes double for any Star Wars nerds out there.